In 1864, in the middle of our “great Civil War,” America held a presidential election. Lincoln was President. None were confident, especially his supporters, that he would be re-elected. Indeed without the gift of a Grant victory at Petersburg, it’s pretty clear he would not have been reelected. The nation was exhausted by war. Most Americans were resolved to peace at any price. Lincoln would not promise peace unless the union was restored. But he did decide to campaign for reelection in a way that has never been matched in the history of the Republic. Rather than running as a Republican with a Republican as his running mate, Lincoln ran as a Republican with a Democrat as his running mate. In 1864, Lincoln and Andrew Johnson ran on the “National Union Party” ticket, the temporary name the Republican Party had adopted to emphasize the single purpose of that election. Their message was simple and clear: America had to step above its partisan divide if it was to save the Union. 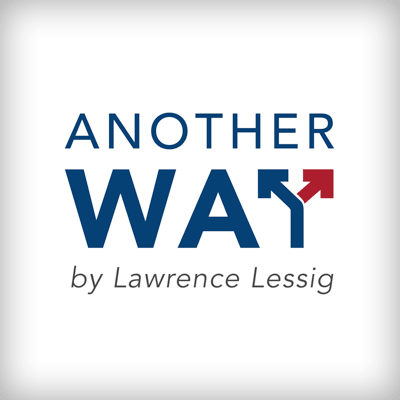 This is Larry Lessig and this is the fourth episode of this podcast, Another Way. In the second, I explained why the ways we fixed things in the past just won’t cut it this time around. In the third, I introduced the first part of a new strategy, one involving Congress. This episode is about the other part of that strategy, the President. I take it it’s impossible today for us to imagine politicians from two different political parties doing what Lincoln and Johnson did in 1864. And if they did, we could only pray that the Vice President was not as awful as Johnson proved to be. Yet what Lincoln was trying to do is exactly what our nation needs right now: candidates who are, and would be understood to be, above party, beyond party; “country over party” Americans committed to a platform that spoke to the common aim to restore a democracy that America could trust. That platform must set the terms for that trust. It must make clear that the priority would be to fix this Republic first. We need a time-out from the partisan fights. We need a common commitment to repair before we do anything more. So for the first two years of this new administration, the President and her VP would commit to pushing no legislation beyond any that would enjoy overwhelming cross-partisan support. And first among that legislation would be the package of reform that would make representative democracy possible again. After that reform was enacted and an election confirmed one party over the other, ordinary politics would return. Once the system was remade, then if the nation voted left the left would lead, if it voted right then the right would lead. But either way, the politicians would lead with a system that represented America, if not again then maybe for the first time. These candidates for national office, the only two in our constitutional system, would thus ask America to rally for something more than a partisan fight. They would ask America to demand that the broken institution of our Republic — Congress — be fixed. Through their victory, they would give reformers of Congress in Congress the moral authority that they would need to force their reforms onto that broken institution, and through their leadership, they would remind America that its leaders can actually work for a common good together. So what would that reform have to be? For the past decade, I’ve worked on democracy. I’ve written and spoken and rallied and run — all trying to support a movement that could fix our democracy. At first, my focus — maybe my obsession — was on money. I wrote a book, Republic, Lost, in 2011, that argued that money was at the root of all of our problems. “For every thousand hacking at the branches of evil,” I wrote quoting Henry David Thoreau, “there is one striking at the root.” The root, I insisted, was the corrupting influence of the politicians’ dependence on campaign money. But over time I’ve come to see that money is just one example of a much more fundamental problem. That problem we can see again and again, in practically every institution of our democracy. That problem is the unrepresentative character of our representative democracy. It is the many ways in which our institutions have been rigged to defeat the ideals of a democracy. Money is just the most obvious example. Candidates for Congress and members of Congress spend anywhere between 30% and 70% of their time raising money. But they don’t raise that money from the average American, they raise it from a tiny, tiny few, no more than 100,000 Americans. That tiny few have enormous power in our system. The rest of us do not. Gerrymandering is another obvious example. The politicians draw the districts to create as many safe seats for themselves as they can, seats where the party that will control the seat is practically guaranteed. That means that the minority in those districts, Republicans in safe-seat Democratic districts or Democrats in safe-seat Republican districts, doesn’t matter to the representative of that district. The only challenger that could matter is a more extreme member of their own party. They get represented. The system suppresses the representation of the rest of the district. Or the Electoral College is another obvious example. Because the states allocate their electors to the winner of the states’ popular vote, the only states that matter to a presidential candidate are the so-called swing states, the states where the parties are so close that either side conceivably could win. Those states — and that was 14 in 2016 — receive practically all the campaign spending. 99% in 2016. And so they get represented by the President because the President knows he or she needs them. The problem is, they don’t represent America. They are older, they are whiter, their industry is 19th- and 20th-Century industry. Yet the system gives them power over our President and it suppresses the power of the rest of us over the President. Or the way that politicians suppress the ability of citizens to vote, either by purging them from the election roles without any real notice or making it more difficult for some to vote over others. That again makes some more represented than others. In every example, the story is exactly the same. Within our so-called representative democracy — a democracy that is supposed to represent us and represent us equally — the politicians have built institutions that give more representation to some. That is a betrayal of the basic commitment of a democracy. And that betrayal Congress could fix almost completely and almost overnight. Congress could change the way campaigns were funded and end the outsized influence of some, by making candidates dependent upon funding from all of us, not the very few. Congress could end the practice of gerrymandering, at least as it affects Congress, by demanding neutral systems at the state level and allocating congressmen proportionally if the state refuses. Congress could end the system of winner-take-all in the selection of our President, by declaring that the system violates the 14th Amendment’s one person, one vote principle, and exercising its power under that Amendment to remedy that constitutional violation. And Congress could end the suppression of the people’s vote, by empowering voters and voting rights organizations with the legal tools that they need to assure that everyone has an equal freedom to vote, regardless of party or of race. All of these problems Congress could fix through ordinary legislation passed in the first months of 2021 if, at least, we could elect a Reform Congress lead by a Reform President and VP. So how could we do that? What strategy could we embrace? That’s the subject of Episode 5, maybe the most surprising episode of all.